A good product, well-documented, is better than an excellent product that's poorly documented. Why? Because product profitability relies on efficient replication of the original design. Engineering drawings describe how to consistently reproduce the design. Consistent reproduction is essential, since it forms the basis for product improvements and production efficiency. Engineering data proves that the product conforms to the original design goals. Proof of conformance is important to both internal stakeholders (marketing, accounting, production) and external groups (distributors, customers, service providers, regulatory agencies). But simply creating engineering drawings and recording engineering data is insufficient. To be useful, engineering drawings and engineering data must be stored, reviewed and approved, published and maintained. In other words, engineering drawings and data require engineering document control. PDXpert helped us get our documentation under control! Engineering drawings that reflect a consistent set of attributes, and are controlled using a documented set of procedures, significantly reduce product costs by simplifying design, sourcing, production, customer adoption and field service. 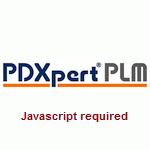 PDXpert PLM software offers these precise advantages. A complete engineering drawing management environment encourages archiving as much "organizational knowledge" as possible. The ideal system captures all the data that would allow performance analysis, field diagnostics, and incremental design improvements over the entire product life cycle. Engineering drawing management capabilities should include efficient methods for creating design document and part data records, managing assembly structures, storing electronic file attachments, and processing engineering change forms. Clicking on file references within PDXpert immediately opens the corresponding drawing, specification, document or file, saving hours of time and greatly improving the use and reuse of parts in new and revised designs with substantial reduction in cost of inventory. PDXpert PLM software provides a comprehensive set of engineering document control capabilities that in-house solutions can't match. From revision-based electronic file management in a centralized data library to change workflow that encourages detailed design reviews, PDXpert PLM software solves many of the document control challenges that face growing companies. These functions translate directly into real benefits including increased sales revenue through faster engineering drawing releases; lower product costs by instantly displaying the most current engineering drawings and parts; and lower administrative overhead by allowing users to attach important supporting engineering data directly to document records. As engineering departments' requirements have expanded, engineering drawing management solutions have become more sophisticated. Product lifecycle management software is the evolutionary descendant of simple "engineering drawing control" software. PDXpert PLM software provides the necessary engineering drawing management capabilities and, equally important, automates and enforces the many processes necessary for good engineering data management. And, PDXpert PLM software goes beyond just engineering document control by including the functions essential for managing the complete product design life cycle, such as part records, bills of materials, engineering changes, and materials composition. And it's all done within a simple and flexible software application. PDXpert PLM software has been specifically designed for growing companies making the transition from inefficient and costly manual document control processes to a modern engineering data management tool.